The past quarter has been very exciting and fruitful. We held the 2nd Honour International Symposium that was attended by over 350 delegates, almost 3.5 times the number that attended the 1st such symposium two years ago. We hosted the 6th Honour CEO Forum with over 90 CEOs and C-suite executives attending, the largest number of participants up till now. And we continue to engage with school leaders, community leaders and business leaders to promote a culture of honour and honouring for the well-being of our nation with honour-directed individuals, honour-directed families, honour-directed communities, honour-directed organisations and honour-directed nation. This quarterly newsletter updates you on the key events as our partners in the worthy cause of honour. 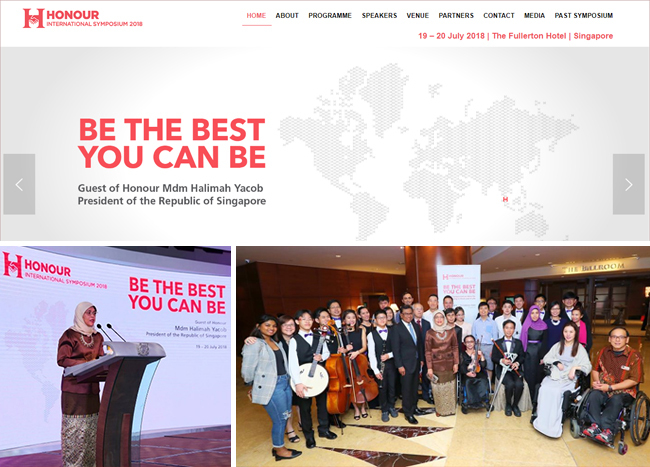 Honour International Symposium 2018: The 2nd Honour International Symposium was held on 19-20 July 2018 at The Fullerton Hotel Singapore. It brought together over 350 delegates from business, government, and community groups to reflect on issues of honour and honouring for successful business, stable homes, and strong nations. There were 14 speakers and 23 international participants from 10 countries, namely, Brunei, Canada, China, Ghana, Indonesia, Japan, Malaysia, Philippines, Switzerland, USA. Madam Halimah Yacob, President of the Republic of Singapore, was the Guest-of Honour for the Welcome Dinner; her message was most encouraging. More about the opening event at: http://www.honourinternational.sg/media. You can now look forward to our next Honour International Symposium in 2020. Two of the presenters this year, Mr Tay Lai Hock, Founder of Ground Up Initiative, and Ms Katherine Yue, former nurse who was terminally ill, passed away a few weeks after the event. We are grateful for their inspiring messages in word and song. They lived their beliefs and convictions, and each made the world a better place in their own way. Even as we express our condolences to their loved ones, we also know that we are blessed to have had the privilege of benefiting from some of their last contributions. Honour Film Initiative: We continue to support young-adult filmmakers and student filmmakers from Ngee Ann Polytechnic in producing short films and documentaries on the theme of Honour and Honouring, starting with honouring the invisible people, and now moving to the larger theme honouring each other in a gracious society. Our films have garnered well over seven million cumulative online views with numerous positive and encouraging comments. We will be unveiling a new slate of short films at the Honour Film Screening on 2nd November 2018 at The Capitol Theatre, and are currently seeking sponsors for the event. If you or your company would be keen to support this event, please get in touch with us at admin@honour.sg. One of Singapore’s first female Olympians, Mary Klass, whom we featured in the Honour short film trilogy When the Stars Align, was among 5 inspiring Singaporeans in the spotlight at this year’s National Day Parade! 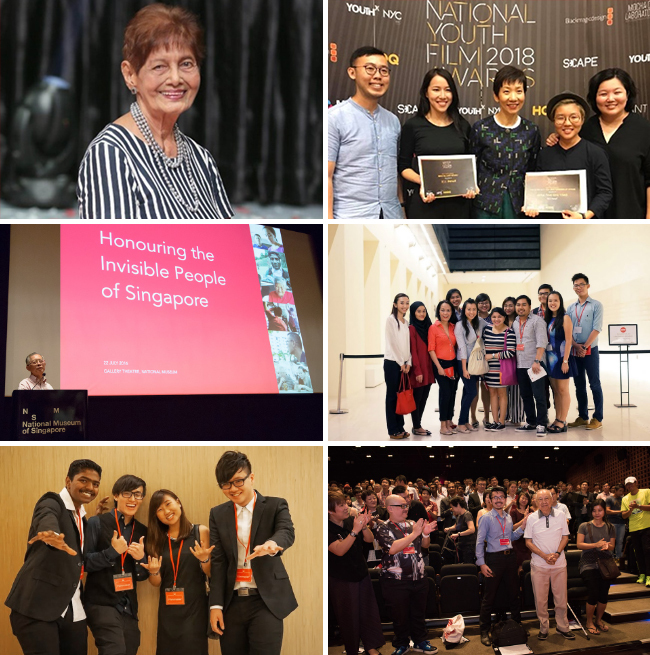 Mary Klass, a 83-year-old grandmother of four, is the true embodiment of the Singaporean Spirit with her words of encouragement to the young: “For Singaporean youths, be proud of what you want to do and what you want to achieve, train hard and always stand tall for your country." Another of our short films, Pencil, swept both the “Best Picture” and “Best Screenplay” awards (Open Youth Category) at the National Youth Film Awards 2018! A huge congratulations to the passionate team, whose story about integrity, friendship and honour — based on actual childhood experiences — won the hearts of the jury! Learning Journey: Since the introduction of our Honour Learning Journey Programme in 2016, we have connected with some 15 schools and reached out to over 4,000 students and 90 educators. Through the highly energised facilitated sessions, the students were able to better understand the importance of Honour for work and life, and gained practical insights on ways of living it out in their own lives. If you are an educator and you would like to explore the use of our films in values education, please get in touch with us at admin@honour.sg. CEO Forum: The CEO Forum is a periodic forum that we organise to bring together leaders of organisations, big and small, to share perspectives on Honour and discuss how Honour could be beneficial to their organisations and businesses. If you are a CEO and would like to attend one of these forums, please get in touch with me at LimSiongGuan@honour.sg to express your interest. Talks: I continue to speak about Honour, on an invitation-only basis, at schools, companies, and community groups. If you believe such a session would be a boost to the vision and morale of the people in your sphere of influence, do let me know at LimSiongGuan@honour.sg. Audited Accounts: Finally, on an administrative note, we are glad to inform you of our accounts for the period 1 June 2017 to 31 May 2018. The auditors have found them to be in good order. You can find a copy of their report here. As always, thank you very much for your most generous support and encouragement for Honour (Singapore). I look forward to hearing your ideas and feedback on how we might be able to do things better. Please get in touch with me at LimSiongGuan@honour.sg. Should you wish to support our efforts financially, donations of any size will always be welcome and deeply appreciated. As Honour (Singapore) is a charity with the status of an Institution of Public Character, all donations from individuals as well as corporate organisations will enjoy enhanced tax deduction. Thank you and all my very best to you and your family.